The relentless growth of digitization is here to stay and the year 2019 will not be too different. The year is expected to witness a few website design trends to garner user attention and help businesses stay competitive. There shall be a greater integration of aesthetics and technology like never before. Let us delve into the web design trends that are likely to define the year 2019. Broken grids and asymmetrical layouts: If grid based designs have ruled the roost so far, web design in 2019 shall be more about looking outside the box and pushing the boundaries. In other words, web designers shall look to break out of the standard template by placing asymmetric patterns. These include unusual placements, adding layers with textures, colours, and white spaces, and using typography to give a sense of depth. Such innovative use of visual hierarchy and dynamic imagery shall help in engaging the users’ attention in a better way. Fluid or organic design: Has flat design as a part of website design become passe? Not quite! But the trend is more towards pulling away from grids and injecting an element of fluidity in design. This is done by incorporating organic shapes or lines that are not exactly geometrical or precise – square, triangle, circle etc. A fluid design appears more realistic and approachable, for it embodies the shapes of hills, lakes, torn pieces of paper etc. The year 2019 shall see an increased use of organic shapes that are closer to human nature and thus, more engaging. Elevated images: Website design experts have always experimented with image design by using sundry techniques to draw the attention of users. These include adding a shadow behind the image, enclosing them within geometrical patterns like circles, squares etc or turning them into sepia tinted objects. The year shall see the image treatment pushing images to draw or pull away the attention of users. The new techniques to make the images appear enhanced or elevated would include adding a pattern on top or turning the image monochromatic etc. Parallax: The technique creates an illusion of depth when the background images move slowly vis-a-vis the ones in the foreground. Since heavy 3D graphics can slow down the loading of a website, parallax can offer a virtual immersive experience to the user in a 2D environment. 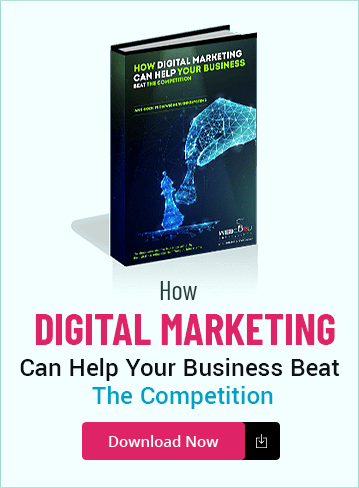 The technique can be leveraged by the website design services to enhance the user attention on a product or service thereby encouraging him or her to stay longer on a page. Micro interactions: If browsing a site offers a surprise or two in the form of small actions or responses, it would generate a better user experience. This is where micro interactions can play an important role as a part of web designing. These are events purportedly aimed at surprising and engaging the user and can be classified into two types – software generated or triggered by user interaction. For example, when you hear a beep sound while refreshing a page on Twitter or viewing the red icon on Facebook showing the message count, you experience a micro interaction generated by the software. On the other hand, should you view a subtle change in the background of a digital element in terms of its texture, colour, contrast or even design as a result of an user interaction, the micro interaction is said to be initiated by the user. For example, when a user fills the password column during signing up on a portal, the strength field gradually changes from red to green intimating the user about the strength of the password. The micro interactions can be seen in many forms such as scrolling animations, chimes etc, which convey a subtle message to the user about certain actions performed by them on the page. Material design: Developed by Google, material design helps in creating an immersive user experience by using standard UI widgets, custom shadows, animations, elevated card layout, vector drawables, and buttons among others. This particular type of website design involves the use of flat and light objects and improves user interaction in a big way. The absence of colour: Although the interplay of colours adds to the aesthetics of a website, the absence of the same can make the website look distinct inviting attention. When most websites have design elements that are awash with colours, turning your site into a monochromatic one can make it stand out and memorable. The year shall see less usage of colours (read mostly neutrals – black, white, and gray,) in order to make a website noticeable. Abundant use of white spaces: Although this has been in vogue for many years, website design in 2019 might see the usage of white space in abundance. This will make it a focus area for the viewers rather than the content. It is more to use it as a contrast with the twin objectives of giving the eyes a rest and making the design distinct and worthy of attention. Thus, if earlier, white spaces were thought to be a ‘waste of space’, the year 2019 will see these adding value to the layout. The year 2019 will see the continuation of trends like flat design but will incorporate more design elements like broken grids, organic design, micro interactions etc. With competition getting more intense by the day, your business should have an online presence that is trendy, attractive, and user friendly. 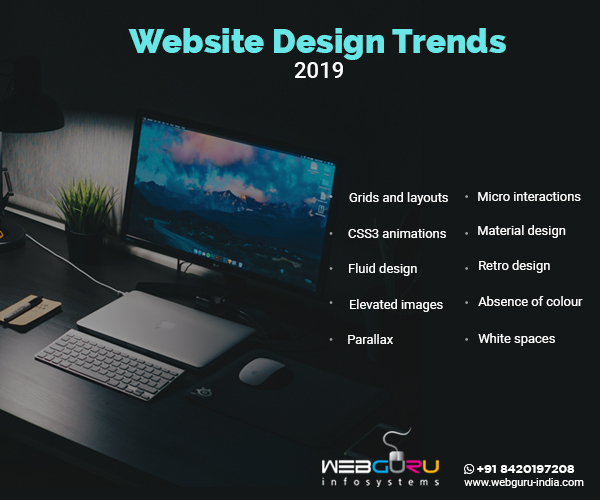 To achieve the same, it is better to incorporate the website design trends of 2019 – inhouse or by engaging an experienced website design company. 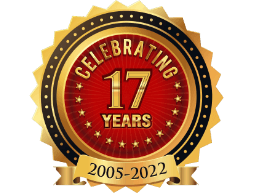 This was an amazing blogs thanks for sharing the posts. 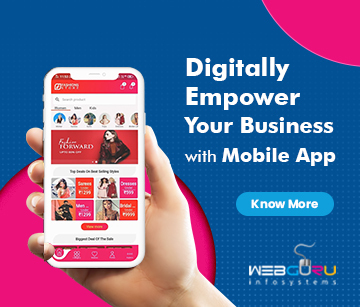 Hi, thank you webguru infosystems for sharing a valuable information.I’m also a software engineer, your article very helpful for me. Those are all top advanced web designs reduce our tension and save our time, these web design trends are helping to design a perfect website without hassle. Once again thank you so much. keep posting. Your article is great and its really helpful for me all is good. Thanks for sharing keep up the good work.